On Saturday, October 27 at 0940 am, Carlos Arenas was on his way to Potrerillos when he saw a phenomenon that captured his attention. 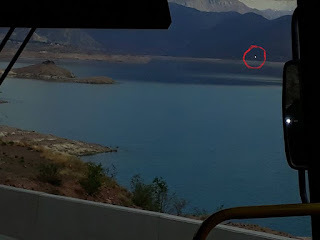 Using the zoom on his cellphone, he was startled to be able to see a light moving over the Potrerillos Dam. 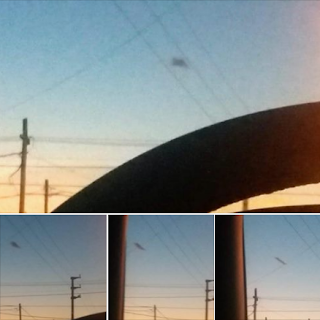 Carlos was able to capture the images with his cellphone and published them on Facebook, asserting that it was a UFO. Arenas wrote: "UFO over Lake Potrerillos, yesterday, Saturday 27 October 2018. I photographed it at 09:40 from the bus as it exited the Potrerillos Tunnel. Its leftward movement is perfectly visible. It was cloudy at that time. Now Potrerillos has alien tourists!" Encounters of the first kind: seeing a UFO, a simple sighting. 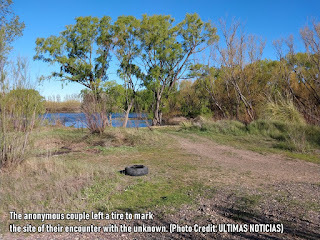 Encounters of the second kind: when a UFO lands and leaves imprints or marks on the soil. Encounters of the third kind: when there is contact with a craft and its occupants, whether visual or physical. 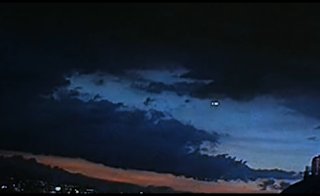 Encounters of the fourth kind: Abduction, that is, when an earthman is abducted by a craft. Encounters of the fifth kind: when mental or telepathic contact occurs with occupants of alien craft. The case that concerns us took place on Sunday, 18 February 1996 in the peaceful locality of Mburucuyá, some 144 kilometers distant from the capital. Numerous reslidents witnessed how a luminous unidentified object virtually paraded over the community, issuing flashes of many colors and keeping the citizenry on edge for approximately five to six minutes. 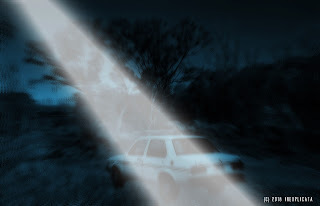 Radio Alfa FM sounded the alarm an people turned out in droves to the edge of Route 13, where they were treated to the sight of a strange object that emitted a very odd light, whose color was akin to bright white shifting to pink and then practically red. Later, before the startled eyes of the many witnesses, the object changed position several times with its lights off. The story prompted the immediate presence of Máximo Cantero, a 35-year-old man at the time, a veteran of the Malvinas (Falklands) War, married with four children. He retold a spectacular experience he had had the night before, possibly with the very same object. 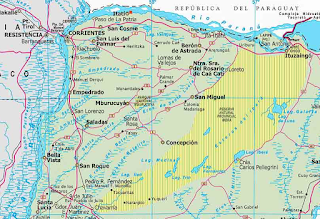 Speaking before a radio audience, the man said that he had traveled to El Descabezado, a rural area located on Provincial Route 11. Since his car suffered an unexpected breakdown (it was rendered completely without power) and he was unable to fix it, he decided to set off to the town on foot - a 30 kilometer distance. On the road he came across a friend an neighbor, who loaned him his horse for a faster return trip, once informed of the accident. The animal would be returned at a suitable time once the problem had been solved. However, shortly after beginning his journey he saw a bright light that filled the countryside. "I didn't pay it much mind at first," he said, "thinking it was moonlight. But as it grew brighter, I looked up and found myself staring at an oval object that made no noise whatsoever. It was completely silent. To my surprise, the object came closer and closer, slowly, and at that time my skin broke out in goose pimples, a very strange sensation. The horse also became rather nervous so I hurried along." Being a practicing Catholic, he began to pray fervently until he reached the house of Rito Riquelme, another neighbor, who accompanied him with his wife to look at the object that remained motionless, constantly changing colors. All three were stunned. When the object was near the couple and Cantero, it calmed down and after endless minutes, vanished at high speed into the firmament. After all this, the man chose to continue his journey, praying the Rosary, although the strange light appeared once more, escorting him into town. Cantero traveled the remaining seven kilometers at high speed, reaching his house in a state of nervousness after all he had experienced. He later said that "he was fearful that he UFO, unknown object, or whatever it was, would take him and spirit him off to some unknown galaxy or planet as a sample of Earth life. At that time I thought about my wife, my children, my relatives and friends, who I would never see again." He firmly stated that this is not the first time such strange apparitions in the sky have befallen him. The had occurred before, and he had even taken photos. He ended by musing: What could these beings be after in this part of the Northeast, especially in Mburucuyá, whose villagers have been surveyed many times during that season of the year. Jokingly, he noted: "Perhaps they heard the sound of our chamamé during the last festival, which was highly successful, and couldn't resist to come and take a closer look at what was going on." He smiled, but his nervousness wasn't completely dispelled. It was, without question, an experience that marked him forever. Further corroboration for Cantero's statement came two days later. 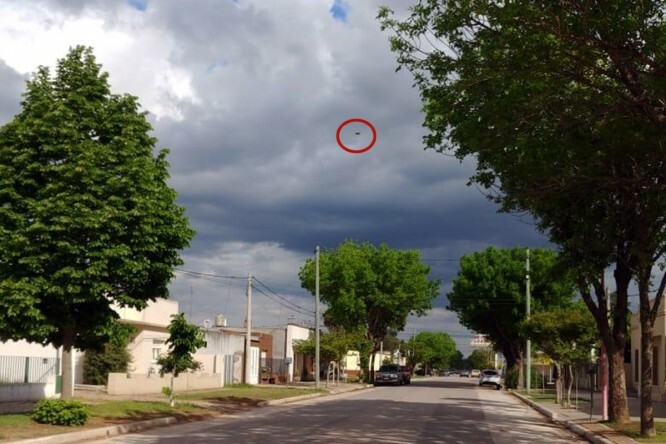 Julio Sesín, a local businessman from Loma Alta in the first section of Mburucuyá, told the sheriff's office that he had seen an unidentified flying object in the area, of average size and very bright. He also stated having seen - in the company of his children and some twenty locals, a bright, large pink light in motion, clearly visibly against the cloudy sky that had preceded a rainstorm. Just another of so many cases that have taken place in our province and which often do not become public knowledge, but which have taken place and continue to happen, no matter what anyone says. 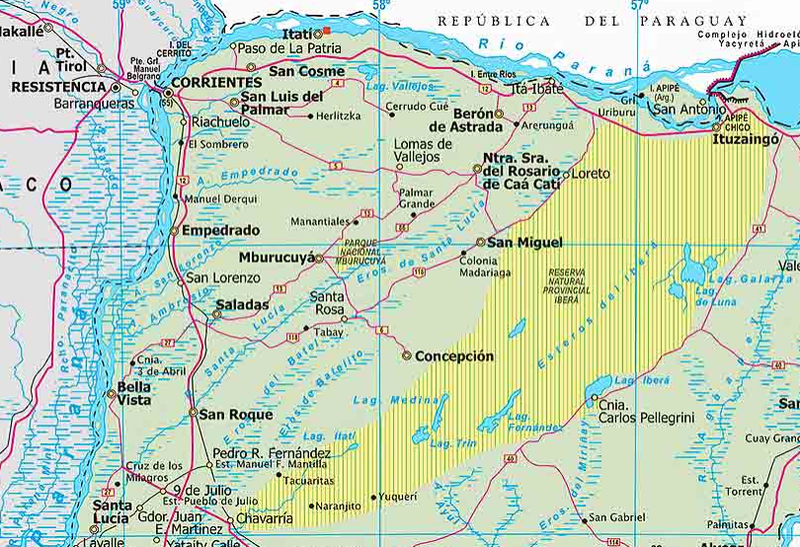 The alleged sighting took place in the locality of Quemú Quemú. Several phenomena of this sort have been reported in recent times. A reader contacted infopico.com and shared the photo taken recently over Quemú. While storm clouds gathered overhead, it is possible to make out a circular, dark object among the clouds. It did not resemble a conventional aircraft. 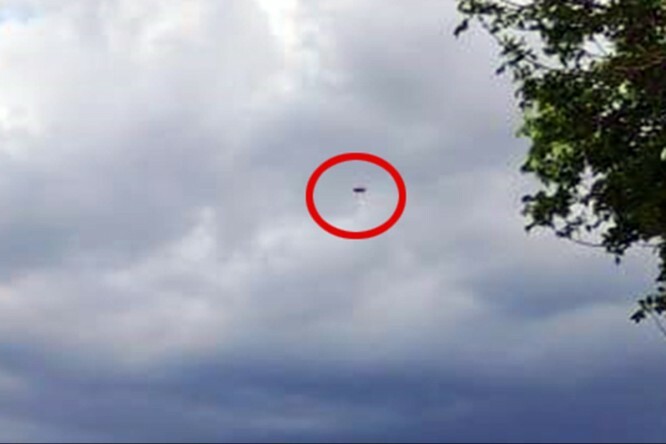 Mexico: Alleged "UFO" Captured on Video Declared "Absolute Proof of ET Existence"
In recent years, hundreds of videos have circulated on sightings of strange objects and phenomena in the skies. These are immediately associated with UFOs and the presence of alien life forms. However, what would prove each of them has been easily dismissed by specialists and experts in ufology through the analysis of audiovisual materials. In spite of the abundance of this material on-line, a recent recording disseminated on You Tube three days ago - also associated with UFOs and ETs - is causing wonder on the Internet, as it is touted at the "absolute" and "irrefutable" proof of alien life. The video, with over 14,000 views on the web, shows a bright light moving from left to right before accelerating and vanishing in the clouds. Nonetheless, when the author of this recording - taken in Mexico - increases and decreases speed to see it better, it affords a better view of the object which, according to cybernauts, resembles "a spaceship with a force field around it." These images were taken from one of the cameras that broadcast live images of the city, but research and analysis of same was conducted by an expert in Australia. On Saturday, a young man found two distinctive drawings in the snow, but found no human footprints. At around 20:00 hours on Saturday, a youth from Moquehue (Neuquén) went out on his motorcycle to ride through a seldom-transited area along Route 117 and found strange drawings in the snow. The young man said that after seeing the drawings, he alerted his family and they returned to the site to take photographs and inspect the designs. "I was surprised that there were no footprints nearby. This in an area that is rarely visited," he added. The ground marks were found on Route 11 heading toward Norquinco in an area that remains closed in winter and only recently reopened in the spring. 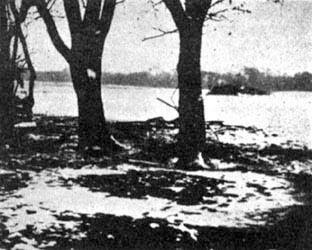 Patches of snow often remain and that is where the marks were seen. Other local residents said that drawings similar in their size and perfection were found a kilometer distant from the site. "I believe UFOs exist. Perhaps it was them," Rodrigo concluded. Note: Luis Burgos from FAO has noticed a similarity between this phenomenon and drew comparisons with another classic case: "The famous and controversial Delphos Case in Kansas, USA, 1971. It snowed afterward and the UFO mark was highlighted." Six airliners in flight reported three objects whose movement suggests the possibility of their being unidentified flying objects. The mysterious event took place last May, but it was discussed again only a few months ago, as the conversations between the pilots aboard became known. The airliners were on their scheduled runs with nothing to report until a LAN-Chile airliner reported the presence of some lights near a control point known as Livor. Shortly after, a pilot for the COPA airline confirmed it with a photograph, capturing 3 shiny unknown objects. 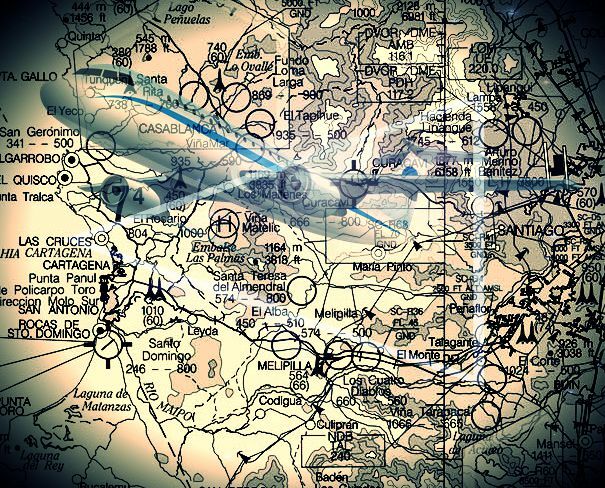 A total of five LAN-Chile flights and one COPA flight pointed out, almost simultaneously, the sighting of three unidentified objects seen by pilots and those at the control post located 380 kilometers east of Antofagasta. CEIFAC - Center for Anomalous Phenomena Research of Chile - published a video with the aviators' recordings. Due to the objects' movements, one of the flights had to detour some 20 miles off its course to insure passenger safety. The pilots' voices say it all. COPA 174: We have lights on the left and one is fading away. Affirmative, it appears to be at our same altitude. It wasn't at Livor, because the lights are there. No traffic is reported and we don't know what it is. One light just disappeared, there's only one left. LAN 639: Santiago, Lan Chile 639 ¿Could you indicate the identification of the traffic ahead of us? LAN 2473: 2473 is go. LAN 639: Position downward. Apparently over the sea. Could you also identify another light? LAN 2473: Look sharp. We have another light in view, approximately at our 4 o'clock. Where there were two [lights] there's now only one. LAN 79: Affirmative. I can see it clearly, a little more to the south of (...) at sea level. A very small light, appearing and disappearing. COPA 174: Copa 174 to Livor, 340 and we now have 3 lights. We are to the right of Livor 340 and the lights are to our left, approximately at our 10 o'clock. Lights are moving and increasing and diminishing intensity. In fact, we're turning right as they appear to be approaching. After these initial events, the control tower decided to contact the Oceanic Air Traffic Controller, in charge of ascertaining the traffic of craft flying over the sea, beyond the reach of ground based radar. ATC: You have a note there with UFOs in the Livor block. 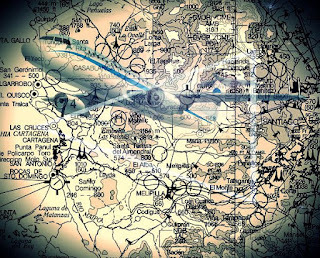 Oceanic ATC: Yes, it's full of UFOs. Oceanic ATC: Of course! That's why the Copa detoured so much. Lan 639 and 2473 also saw them. Minutes later, other flights would witness the same three lights. LAN 501: Santiago, Lan Chile 501, holding position at 08 11, flight level 370, estimating Livor at 08 32, Sulna next. We have that light at our 1 o'clock around the Livor block. COPA 174: What an odd phenomenon. Now we have 3 lights shaped like a triangle. LAN 577: Santiago Lan Chile 577, Livor position at 08 34. Sulna next at 08 12. Livor next at 08 34. We will advise Livor. ATC: Lan Chile 646 Oceanic? LAN 501: Lan Chile 501, and there it is, the third light appeared. LAN 577: Yes, some 60 miles from Livor and we also confirm (...) yes, between 2 and 3. Could be some 2000 feet below at a distance of some 20 or 30 miles. LAN 501: Affirmative, we have them now almost a 3 o'clock. One's brighter than the other, and they are two lights. The control tower chose to advise another aeronautical authority of these events. ATC: Good morning sir. This is the Oceanic Control Center in Santiago. ATC: Good morning, there's a rather strange situation in the Livor sector. There are some 5 or 6 aircraft in the Live for Lima 780 air corridor reporting a movement of lights. Two, four, up to four lights in that sector, to the east. To the west of the Livor sector, at their own level or lower. The situation is ongoing. Three aircraft have reported it. In fact, an aircraft detoured 20 miles to avoid them. Altitude is approximately thirty two thousand. Now there are two traffic coming along the same corridor from the United States and are flying over the sector. They also have them in sight at 2 or 3 o'clock, over the sea. COA: In the Livor sector? ATC: Of course, and there is no traffic. We have our own traffic controlled. But we cannot see the lights maneuvering there on radar. The phenomenon continued for about half an hour. ATC made the decision to advise COA "to avoid any situations." LAN CHILE 501: We have lights at our 4 o'clock at that position. According to CEIFAC, one of the first hypotheses put forth for the event was that the lights belonged to seagoing vessels in the area "arising from changes in air density that created a light refraction, causing the optical illusion of being over the sea." However, the organization dismissed this given that the lights, theoretically, appeared to move intelligently and form a triangle. Furthermore, had it been a consequence of light refraction, the reflection would have been still. 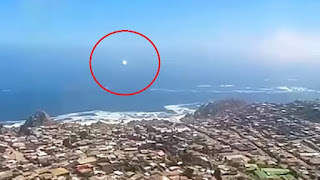 A resident of Chile's 4th Region shared a strange video showing a luminous object over the bay. What did ufologists say about it? 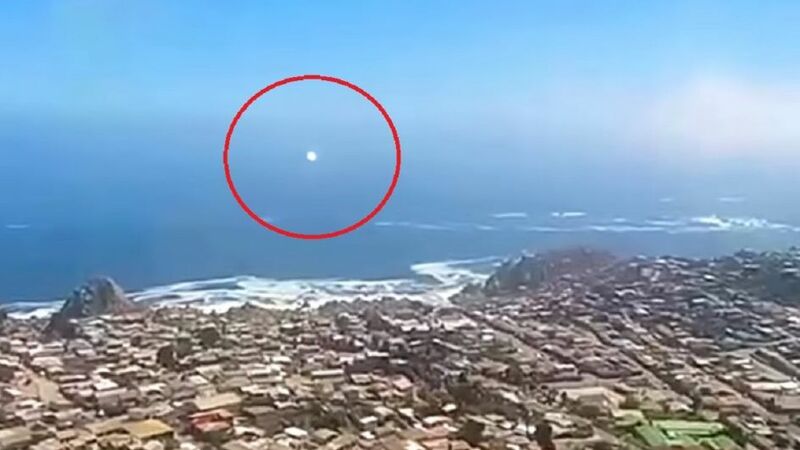 A resident of the region of Coquimbo, Chile shared an odd video showing a supposed UFO high over the bay near the "Cross of the Third Millennium". The viralization of the image prompted a debate about the recordings authenticity online. 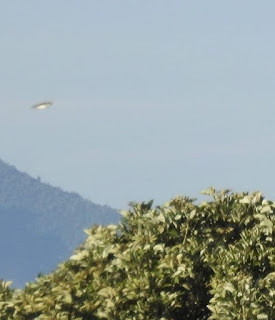 The visitation of what the author refers to as a "foo fighter" (orbs with a metallic appearance or balls of light) even reached the morning shows on trans-Andean television, where experts in ufology debated the supposedly alien phenomenon. Despite the fact that many believe in the image, many also claim it is a simple trick of light with a luminous artifact, closer to Earth than one might think. "We cannot say that everything we see is a spacecraft or that it contains occupants. 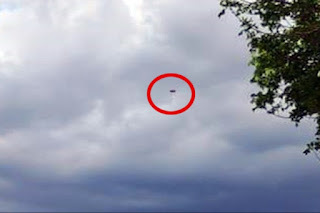 We see many strange things, but 99% have an explanation - a satellite, meteorological phenomena or human artifacts," said Marco Antonio Gómez, 58, of Marcc UFO. The Chilean researcher told the press that one must remain calm when in the presence of an unidentified object and keep recording to the very end. "This is because [the Internet] is full of videos that cut halfway and in the end one does not know what happened - whether it turned off, lit up, exploded or went off to another universe." 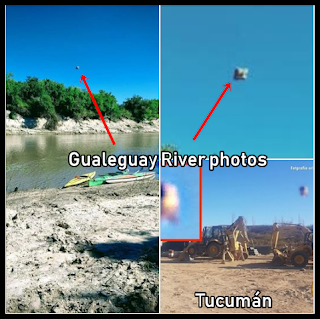 Luis Burgos writes: "An interesting photograph taken at random on Sunday, October 7, at the Gualeguay River (Entre Rios) by Laura Marcocich of the Villaguay Kayak Club. It is not included in the 2018 wave by virtue of being an artifact not visually detected. It even bears a certain similarity with the object photographed in Tucumán and published by Javier López Posse (GIOT) which we include here (courtesy of Yamil López Bantar)." Our thanks as always to Mr. Burgos and Guillermo Giménez. "Good evening, friends. I am uploading a draft report of the situation I experienced today around 21:20 hours. This took place in Coronel Brandsden, Province of Buenos Aires. I was on my way to work as an administrative guard from my father's property, who was about to open the cattle gate. We were chatting until we reached said location, about one hundred meters from the house. I waved at him, blew my horn from the car and headed toward downtown Brandsden along the unpaved rural Roade. Only a few meters after leaving the cattle gate - I estimate some 10 meters) I saw a very small light moving behind the car reflected in my windshield. I froze at the situation and hesitated, but I looked at my left rear view mirror only to see the small light pass right beside me before vanishing. "Upon reaching the corner (questioning the situation and still petrified) I decided to phone my father, asking him in fear if there was a motorcycle coming in the distance or if he had shined a flashlight at me. He said that there was no one behind me and that he had no flashlight, noting that "the light had descended from the sky." "He remarked that he was closing the cattle gate when he saw the light descend (a powerful light, in his opinion) and descend with landing or stopping. It followed the car, only to disappear. "I got in touch with Luis Burgos immediately and alerted the FAO via Facebook and WhatsApp. "I'm submitting a simple map of the event area." Arroyo: Do you have any theories about why more UFOs are seen in September? 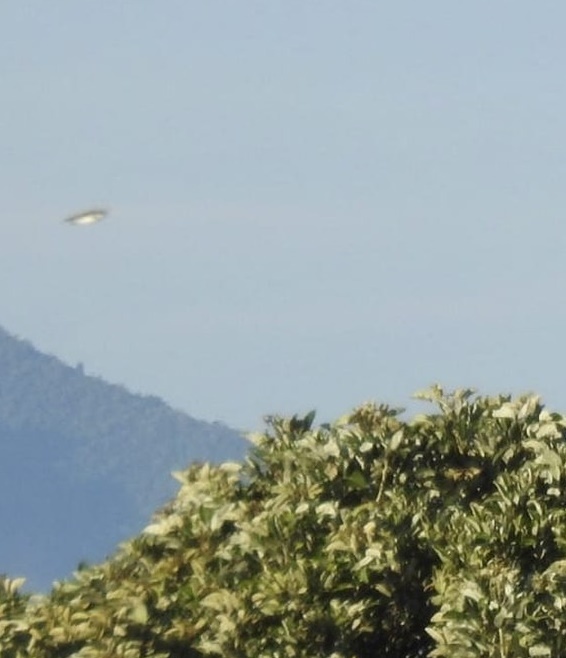 Sáenz: We once spoke to [Mexican ufologist] Daniel Muñoz and he told us that more UFOs would appear in photos and I think in part it's due to what he told us. We've always found photographing them easy, but now we do so more frequently. Arroyo: What types of UFOs have you seen? Sáenz: We have seen two types - luminous ones and disk-types. Arroyo: Do you think there is a direct relationship between UFOs and volcanos? Sáenz: Of course, when we see a UFO there's volcanic activity. When a volcano erupts, the objects fly past and can be seen among the ashes. There is a direct relationship between both. "Today, Wednesday, October 3, 2018, I was on duty on Calle 152 northeast and the corner of 15 and 16 in Berisso (Buenos Aires). While alone inside the cruiser, I looked skyward for a minute, straight ahead, and SOMETHING drew my attention. A dark object glided slowly from south to east at an elevation of 45 degrees. It was dawn and I saw something like a flying triangle changing shape like a teardrop, turning into a saucer as it moved away, speeding off toward the Rio de la Plata (River Plate). I heard no noise or anything strange. I could take some photos with my cellphone from within the vehicle before it vanished into the distance." HUERGO. Two friends lived through an odyssey at the so-called old resort in this locality. A man and a woman were listening to music inside a vehicle parked approximately 100 meters from the 'little beach' of the old resort. Both friends had visited the spot with the intention having a drink, enjoying the landscape and listening to music around 3:30 a.m... All was normal, except for the wind becoming stronger at that time. But something flooded the car in a powerful white light. Everything inside the car turned off, including both people's cellphones. The car began to shake and move. The 12th Federal Meeting of ICOU (United Field Researchers - Investigadores de Campo Unidos) was organized by the Olavarria UFO Investigation center and held at the Science Museum. The event was a tribute to Dante Rivera, one of the pioneers in the phenomenon's research. A meeting of UFO researchers took place in our city yesterday, summoning key figures from all over the country. The event was planned for between 17 and 21:00 hours at the Museo de Ciencias at Parque La Maxima and was framed within the 12th Federal Meeting of ICOU. The event had significant participation from Olavarria and the region alike, numbers that surprised conference organizers and researchers alike. One of the key figures at the national level is Luis Burgos, who has spent nearly have a century devoted to the study of the phenomenon and was a disciple of Dante Rivera, a pivotal figure in our city's ufology. "Returning is very important for me. Personally, this is the fourth or fifth time I've been to Olavarria. The last time was with Dante, matter of fact. We were researching a case here, in situ, and then another case in Sierra Chica, which he had investigated." The work done by Rivera here was evaluated from that perspective. "We wanted to honor him since I consider him a pioneer in this area. Youthful enthusiasm aside, it's a very emotional moment for me, given the fact that grew up with his cases, researching here. I began in the year 1969. I was 13 years old and was already aware of Dante's existence," he recalled. This willingness to disseminate UFO cases stirred young Burgos's curiosity. "I always wanted to meet him due to the way in which he worked and the cases he researchers. It was thanks to him that I was able to get information on his cases, as he began sending us his bulletins, which featured many cases that we did not have in Buenos Aires." Thus, "We would find things out through Dante, through his research." 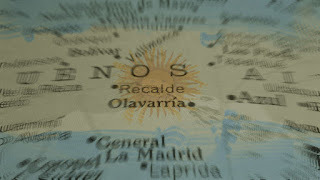 Over time, "I was able to do a statistical study and wondered why Olavarria and its environs had so many reports from people who have seen entities, strange shapes, lights, even in excess of places that are promoted for tourism, such as Bariloche, Capilla el Monte, Cachi or Victoria," stresses the researcher. "This startled me. Later on when I got in touch with Dante, he gave me other cases to add to the statistics. We really do not know the reason [for all these events]." This curiosity causes "researchers to always be in a hurry to find out the truth. But it's not the case. Perhaps we'll depart from this world never knowing the truth. This, unfortunately, is the case, but we must continue or research. There may be other locations for other researchers, but when someone tells me 'humanoids' it means Olavarria. For that reason I entitled my writings 'Olavarria, Land of the Humanoids'." Burgos explains that "a humanoid is the UFO's crewman. We seldom use the word 'extraterrestrial' as we are unsure whether they're from outer space or not. There is an occupant within the craft who descends. Some call them extraterrestrials, others call them humanoids, and other refer to them as ufonauts. To avoid generalizations we use the term humanoid - an anthropomorphic figure." 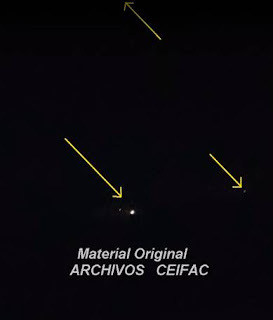 The founder of the Fundación Argentina de Ovnilogía (FAO) explains that contact with UFOs is not as common as it was in the 1960s or 1970s, since "the come in waves (flaps). In fact, we have been experiencing a flap in the past two or three months. The number of cases we have been receiving is truly impressive, particularly from news media in the interior of the country, from our collaborators or correspondents. But the press is playing a critical role in recent months," he asserts, "and we had anticipated this. We conducted some studies and anticipated that 2018 would be a flap year. Fortunately, it has come to pass." As to how public perception of the phenomenon has changed, to the extent that it is no longer a taboo subject, Burgos believes that "today, with 49 years of research to my credit, I think it was much harder before. Not technologically, but as far as the public's understanding was concerned. When I got started, I was 13 years old, the UFO nut, the flying saucer guy. Today, people approach me and say: 'Burgos, I'm going to tell you something that not even my family is aware of, but this, this and that happened to me.' People are opening up, especially if they know that serious individuals are researching the phenomenon with no urge to profit from it or engage in merchandising. It's then that people open up." He believes that "there is an evolution, for sure. This is the 13th conference we've held. At the end of the month we're having one in Cuyo, on the 26th and 27th were have one in San Luis and Mendoza. There is much popular demand, looking for an answer that science is obviously not going to give them. We deal with science, with the astronomer, with the weatherman, with the Air Force, but people see things and we are the go-betweens who say what people have seen. We don't make it up; we don't say 'we'd like it to be a green Martian.' Giving the case credibility or not is up to the researcher. ICOU is currently in contact with people in Chile and the United States who publish our research, and we do the same. Everyone trusts in their colleague and there is more or less communion in Argentinean ufology. Even so, there are many differences. There is a pronounced division between researchers. Some have commercialized the subject. Fortunately, we're on the other side of the street. Today, at the Science Museum, we're having a conference that is free like all the others we have offered. The attitude here is to research and disseminate." On his part, Diego Abelardo, director of FAO LaPlata, praised the "wonderful meeting, as it allows us to be in the city of humanoids, where so many cases have occurred involving specimens seen and supposedly of an extraterrestrial nature, thanks to Rivera's work on the significant cases we've had here." "There is no explanation," in this regard. "The phenomenon comes about because it has been taking place for hundreds or thousands of years. It predates human existence, even; some researchers believe that the situation exists because humankind was placed on Earth by extraterrestrials. These are things to be analyzed and meditated upon. Each one must draw conclusions based on his or her knowledge, and everything is possible." As to the progress won and the ground reclaimed from skepticism, he said: "We would speak of exobiology 40 years ago and they looked at us like circus freaks. Nowadays scientists speak of exobiology due to the proven existence of microorganisms in space that are not native to Earth, and theories are already discussing microbiology and exobiology as though they were a true science." In recent decades, ufology has received a significant boost "from technology, which has aided us considerably in growing as an institution, using infrared cameras, drones, things we didn't even dream about 10 years ago as tools in our field of work, motion sensor cameras," said Abelardo, who forecasted the coming signs of UFO existence: "I'm convinced there will be signs soon, although there are some, but there will soon be greater signs of human evolution." 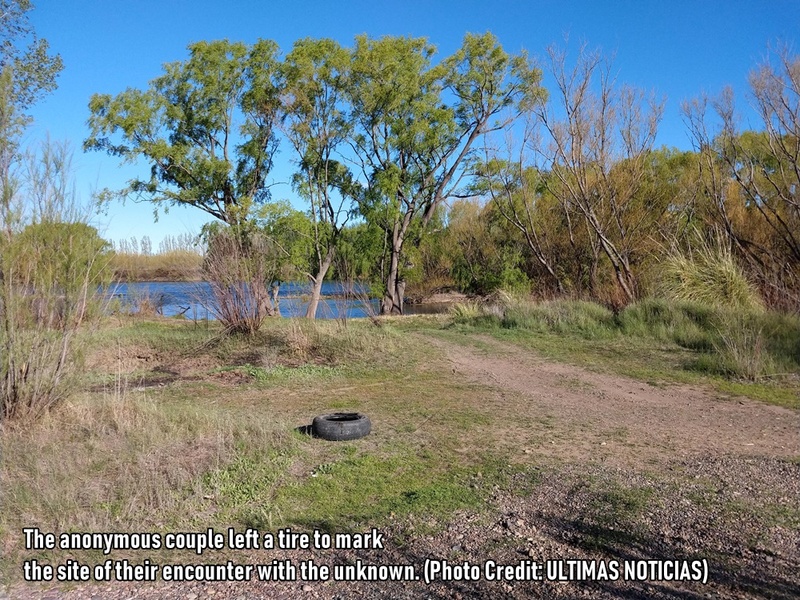 Mariano Lara, an expert for the UFO Investigation Center in Olavarria, explained that yesterday's event "is highly interesting, not only for me but for all the people in the group, where we try to standardize our research and reopen old cases. We have received many calls or messages involving new cases that have befallen people who wish to make them known. For the time being, dissemination is somewhat inward-looking, because the subject is rather taboo and people do not wish to speak of it. Perhaps from now on we will be a channel through which people can express themselves and share the experiences of others." Bringing about the Investigation Center wasn't an easy task. "We have been thinking about creating it for some 3 to 4 years now, and about a year ago we set ourselves up as an individual center, forming part of the ICOU network at the same time to convey information to anyone wishing to join." 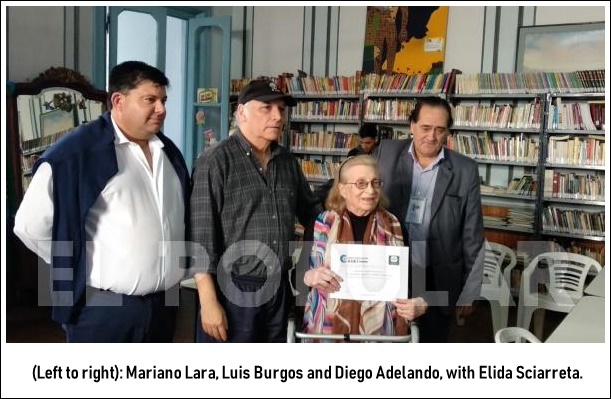 The work of Dante Rivera, a mentor of the 1ro de Mayo Library and nationally renowned for his UFO research, was remembered among the activities scheduled within the framework of the 13th Federal ICOU Meeting. His wife, Elida Sciarreta, was the recipient of a certificate issued by the FAO. A commemorative plaque was also unveiled in the library's reading room. Within this context, Diego Abelardo of FAO La Plata addressed the audiences as "believers in our science, for it is indeed a science. 40 years ago exobiology was a word that did not exist and it is today a science. 82% of U.S. citizens believe that alien life exists, and this shows how the situation has turned around." The group leader added: "Today, from the humble location that is FAO La Plata, with the growth of Luis Burgos and all the history we are carrying forward, we must thank Prof. Dante Rivera for all we have learned through Luis, who brought it to us." 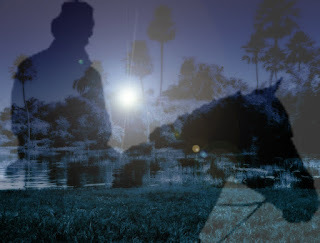 Abelardo noted: "I never had the chance to meet Professor Rivera, but I have read all of the important cases that occurred in Olavarria and we will remember them, because those of us who dared, reached the conclusion that this wonderful science - ufology - is a reality that can no longer be concealed. Therefore, presenting this gift from FAO, by the best student Rivera ever had, is a cause of happiness to us. Think of him always."